The BEYOND Center for Fundamental Concepts in Science is a pioneering center at ASU devoted to confronting the really big questions of science and philosophy. Research projects range from cosmology, through astrobiology to the ultimate fate of humanity. BEYOND tackles subjects as diverse as time travel, the colonization of Mars, multiple universes, the nature of complexity and the relationship between mathematics and nature. Dr. Paul Davies invited Perry Marshall to present the Evolution 2.0 Prize at the Coffee@Beyond lecture series on August 28, 2017. Below is the transcript of Perry’s talk. Introduction by Paul Davies, Director of the BEYOND Center: This is the first lecture in the fall semester series. For newcomers, these lectures occur every month on the last Monday of the month, except when Thanksgiving gets in the way. They are transdisciplinary explorations of the age of knowledge, so we aim to push the boundaries. They range across all of the sciences, and today’s lecture is no exception. Some regulars will know that the origin of life is a recurring theme in these Coffee and Beyond lectures. There are many outstanding problems in the origin of life, but in the opinion of many, the really critical transition from non-life to life was the emergence of digital coded information processing. It’s here where the world of physics and chemistry and biology intersects that of mathematics and computing. It’s refreshing today to get a communication engineer’s take on the nature of this problem. Perry Marshall graduated in electrical engineering as his background. He’s now a business consultant in Chicago. 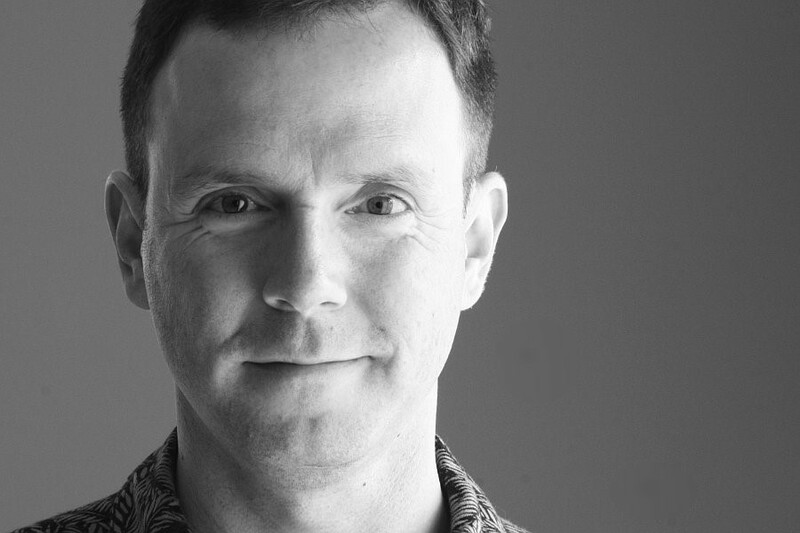 He’s written books on marketing, advertising, and one on the Ethernet, which is in its third edition, and recently a book with the provocative title, Evolution 2.0. Today’s lecture is unusual for us because it will be accompanied by the announcement of an origin of life prize. Stay tuned. The title of the lecture you’ll see behind me – “The Origin of Life: The Evolution of Digital Code.” Perry, thank you. When I was 14 years old I was in Lincoln, Nebraska. I grew up in a very conservative Christian community and my dad was a minister. The church that I went to had a little break from their excruciating exegesis of Greek and Hebrew and such, and brought in a special speaker. His name was John Whitcomb and he was a creation scientist. He didn’t just come once. He came every night for a week. I’ve been a science geek for as long as I can remember, and he delivered this fascinating series of talks explaining how the earth was 6,000 years old, and he introduced an idea called flood geology, which is that all of the features of the earth, including this beautiful Grand Canyon that you see here, could all be explained through 40 days and 40 nights of Noah’s flood. This was a lot more interesting to me than what they normally talked about, so I was enthralled and I thought it was great and I got answers to a whole bunch of really difficult questions. But as time went on, I eventually got an electrical engineering degree and I’ve learned a lot about physics and a lot about the speed of light and a lot of things, and I started seeing some cracks in this view of the world. There just seemed to be certain things that didn’t add up. At this point in time there was no big crisis about this. There was just kind of the lingering accumulation of doubts as to whether this really made sense. If all the constants in the universe, like the charge of an electron or the mass of a proton or the expansion rate of the Big Bang – if all those were on dials, then if you messed with any of the dials at all, you’d get a big catastrophe. And you probably wouldn’t even get a universe at all. The tuning in some places was to 120 decimal places. This was just absolutely amazing to me. As for the guy who spoke at my church… well, if I had thought that was interesting, now this was really interesting! What I ended up doing was trading my young earth creationism for a fine-tuned universe, and discovering that you could literally look in a telescope and you could see 10 billion years into the past and you could witness the birth of our universe. In fact, it’s more amazing than I had ever realized before, so like I said, I made a trade and I was very happy to do it. Fast forward a few years, and my younger brother Bryan, who is one of the smartest people I know and now also the president of my company, had gotten a degree in seminary. He had moved to China, where he was teaching English and doing missionary work on the side. We’re very close and he would email me all of these questions. Now, I’d had a lot of conversations about such things, and I thought I knew a lot of stuff. But you have not had a theological argument until you’ve had it with a guy who knows Greek, Hebrew, Aramaic, and who has spent four years of his life digging through the back alleys of the Old Testament. Bryan had all of these questions and I was drowning. I went to visit him in China and we’re in this bus that you see here, if you can call that a bus. We were on this little trip in the foothills of the Himalayas and we’re arguing again. I said, “Bryan, look at the hand at the end of your arm. This is a fine, fine piece of engineering,” and I’d been doing engineering for a long time. I said, “You don’t think this is a result of a random series of accumulated accidents, do you?” and he’s like, “Hold on, buddy, hold on,” and he pushes back with a kind of classic neo-Darwinian explanation. I wasn’t sure if I really believed that or not. But without even going any further in the argument, I knew a few things. I knew that most biologists would probably more agree with him than me. The other thing I knew, from getting an electrical engineering degree, is there are a lot of things in science that are very counter-intuitive. I knew that in 5-1/2 years of electrical engineering school, random mutation and natural selection as a way to optimize a system was never brought up. I couldn’t recall it, ever. So I went home. I have an obsessive personality. Most entrepreneurs do. I was like, “Man, I’m digging into this.” I’m buying books on Amazon, I’m visiting websites, I’m sure Amazon stock is probably going up, I mean I am really into this and I was lost. I just plunged my way in. I was looking for something that I could grab onto like I can start with some kind of basic principle and I can work my way from there. If Bryan is really right, that falcons could have DNA copying errors and their eyes will get better, if that’s really true I want to know how that works. Because if we have something like that in engineering, man, that would be really valuable. So I was on a serious hunt. I knew what it would feel like if I found it, but I didn’t know what it was. The idea kind of scared me. It was like, “Things seem to be working okay. But Bryan and I might go to Thanksgiving dinner next fall and we could be the atheists in the room and everybody could pray to their invisible sky-daddy and not realize that it’s just paint on the ceiling, and there really is nothing else up there. But I plunged myself into the void, and I was scared. I don’t know where this is going to take me. So… ignore no verifiable fact. One day I was reading about genes, chromosomes, DNA, and genetic code, and I had this flash of recognition. “Oh my word, I’ve seen this before. I know what this is,” and here’s what I saw. In 2002 I wrote a book called Industrial Ethernet. It was a New York Times bestseller and went to the top of the charts. No, just kidding. If you can’t sleep tonight, my Ethernet book may help. I wrote it for the world’s largest professional organization of process control engineers called the ISA, and it’s all about how 1’s and 0’s go back and forth across the wire. This diagram show is an Ethernet packet which is disassembled into TCP-IP packets, and if you want to know anything about how the 1’s and 0’s come into your computer and get unpacked, or come through your router or your Wi-Fi and turned into an email or a YouTube video that you can see on your screen, it all happens like this. You strip things off of one side or the other and you make these transformations. There are certain sections that do certain jobs, so information is moving from this place to this other place, and here’s the data and here’s the format the data is in. There are error correction systems in here. I was very familiar with what you see at the top. 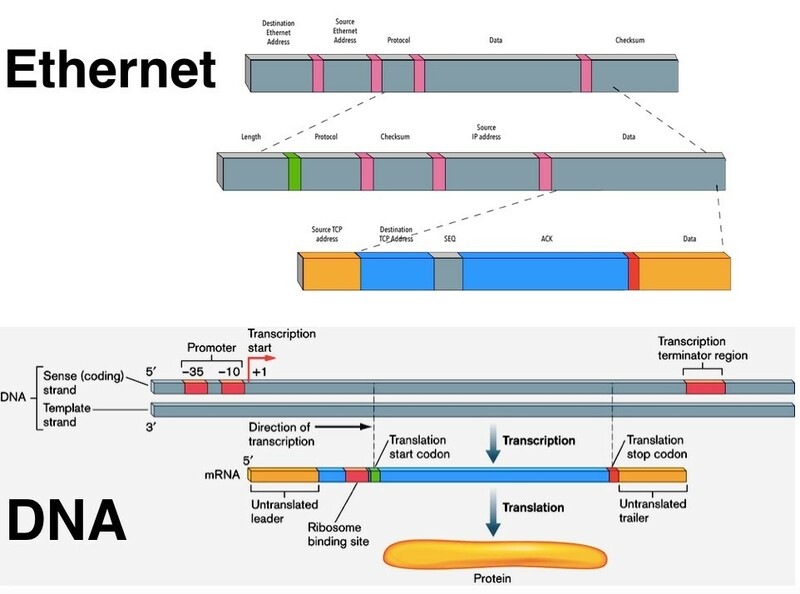 And what I suddenly saw was that DNA transcription and translation is nearly identical. It is digital code and it obeys the same rules and is subject to all the same problems. It’s subject to copying errors and being corrupted. It has to be protected. It has to be re-transmitted if it’s not sent successfully. In about 15 seconds I had the biggest epiphany I’ve ever had in my life, because suddenly I saw that the digital information age that we all live in and that we’re all familiar with, and genetics, are both one and the same. I was very excited and I started buying more books and reading stuff, so that was really amazing. Suddenly I felt like my feet had touched the bottom of the swimming pool. If I had just stopped with what I just told you so far, had I not looked any further, I would have come to a seemingly logical conclusion that evolution was impossible. Because I immediately knew that falcons having DNA copying errors is not going to make them see better. Digital data does not improve when you corrupt it. Ever. In fact, it’s incredibly fragile. The fact that you can drive down the expressway and talk on your cell phone or text or watch a YouTube video is an absolute miracle of really brilliant technology that’s been invented to circumvent all these problems and copying errors. So I would have just become an old earth creationist, I imagine, but I was finding a lot – and I mean a lot – of anecdotal evidence that evolution was true. For example, whales have these little bones near the back of their bodies. They look an awful lot like legs, but they’re just shrunken down. It doesn’t seem like a way that anyone would design a whale, but if you wanted to say, “I think this evolved from something earlier and this just got squashed down,” that would make a lot of sense. I saw a lot of merit to the idea that evolution was true, but within my existing engineering knowledge I couldn’t see: how do you get there from here? Another big epiphany took literally a couple years to come. Somebody sent me a paper and said, “Hey Perry, you might find this interesting,” and I discovered the world of Barbara McClintock. Barbara McClintock was a geneticist in the 1940s who was hacking corn plants by hitting them with radiation and breaking chromosomes and seeing what would happen. She threw this plant a curve ball, and the plant threw the curve ball right back. She damaged the chromosome and the plant wanted to reproduce and it couldn’t do it. Now, could a good writer do that if they really wanted to? Of course they could. That’s what Barbara McClintock’s plant did. I believe that Barbara McClintock’s experiment was the most important experiment in evolution history because it at least gave us a view of what is really going on when there’s evolutionary events. It’s not random and it’s not accidental. It’s actually in response to hundreds of inputs from the environment, whether it’s temperature, availability of food, nutrients, oxygen, whatever. It’s extremely sophisticated. I wondered, “Why isn’t anybody talking about this??? Why have I not heard about this?” I’d been digging hard into this subject. I go to the bookstore and I get these really simplistic explanations from these evolution books, pretty much like what Bryan explained to me, but this isn’t how it works. Fast forward again a little bit, and what ended up happening was, I traded my creationism for Natural Genetic Engineering, the amazing capacity of living things to reprogram themselves. Not only does the genome build the organism, but the organism modifies the genome and it’s a read-write system. It’s absolutely incredible. I said, “This is more amazing than anything either of these two sides were ever telling me.” I was just blown away by all this. All the other codes are designed. Therefore, it sure looks like DNA is designed. So I gave that talk and we recorded it and I put it on my website. In other words, if I think something is true, can I put it on a big giant anvil in public and let a million people pound on it with their hammers? And will it hold together? I’m a specialist in Google advertising, and back then Google advertising was really cheap, and I had this website called cosmicfingerprints.com. And I wrote a series of emails. Some of them talked about this stuff and they made this DNA design argument. I drove millions of people to this website and I built an email list of 175,000 people. And anytime somebody would reply to one of the emails, it would come to me. And I would answer any reasonable person. So I put this talk out there and was driving all this traffic to this site and all these people would come in. Man, some people got really upset. They were not happy about this. Other people thought it was great. Anyway, we were all pounding, pounding, pounding. There was this one guy who came along, and it was very obvious early on that he was a kind of flaming nihilistic atheist. He was really not liking this, and I was backing him into a corner. And he didn’t have a counter-argument. This became the longest-running most-viewed thread in the entire history of Infidels, and this went on for seven years. What I said to all these people was, “Show me a code that’s not designed. All you need is one,” but they never could solve it and they never had an answer. It was one of me and it was tons of them. And I mean this was scary. They were out to eviscerate me. Part of what was going on was that at the time my career was doing really well. I was selling the world’s most popular book on Google advertising. Over in the business side of the world everybody loved Perry, but on this side of the world everybody hated Perry. There were all these websites and they were spewing hatred, and I was not enjoying this a bit. But I was managing to defend myself. So they never could solve it, and eventually the site got sold to somebody else and eventually was taken down. I only had one frustration. The frustration was I couldn’t get this argument to not go around in circles. Because people wouldn’t accept the definitions. And suddenly the argument was over. It just stopped. Just like that. Suddenly there was no more calling me names or anything like that, so that was nice. But then my brother Bryan comes into the picture again. He’s like, “Okay Perry, that’s really nice. You’re little rabbit foo-foo and you can bonk the atheists on the head. Yay. Good for you. “But listen, if I’m a scientist what am I going to do? Do I get to say, ‘God did it, that settles it and let’s go out for a 3-martini lunch?’ Are we going to transcribe our lunch conversation and submit it as a scientific paper? Come on, really!” and he was serious. At first I didn’t totally get what he was talking about, but later it clicked in place. There’s a big difference between proximate explanations and ultimate explanations. What I started to realize, especially as I read more and more and I thought about it, was this is actually a really fundamental question in science, and nobody knows the answer. For example, there could be an undiscovered law of physics that explains how you get from chemicals to code, how you get from non-information to information. And if you could figure that out it would be one of the biggest discoveries of the 21st century. I started to really think about this, and I became less and less sure that this couldn’t be solved. Mostly I started envisioning, “What if it’s solvable? Couldn’t you learn more about the universe IF this was true than if it isn’t? Wouldn’t it serve science more, that if instead of using this as a way of winning debates and winning arguments, if I could use this as a way of furthering science? Because there’s this adversarial relationship that a lot of people have towards science, which I think is very damaging. So what I did was I traded my “God-of-gaps” argument for a decision to never sweep vital questions under the rug. Why should you use a technology prize for a question like this? First of all, I believe that information is THE central question in biology. Biology becomes a lot more comprehensible if you frame it as an information problem rather than just a bunch of chemicals. Again, my Ethernet DNA experience really highlighted that very strongly. Secondly, cells do something that computer programs don’t do. How many of you used DOS back in the day? Bill Gates and his friends came out with DOS in 1981, and I want you to imagine that since that time, no programmer’s hands in Redmond, Washington ever touched the keyboard to program Windows. I want you to imagine that DOS developed an Ethernet connection. And it developed a Windows desktop, and it developed Microsoft Word, and it developed Excel and it developed anti-virus software, and it updated the anti-virus software all by itself. Then we got to the Windows of today through self-adaptation. That’s what cells do. That’s what biology does. That’s why you have to finish your antibiotics, because if you don’t, DOS will evolve into Windows and then you’re dead. It’s absolutely amazing. We don’t know how to build systems that do that. What if we did? Now, I don’t know but I suspect that whatever it is that gets you from chemicals to code is also what produces these higher levels of evolutionary steps. I suspect that there may be something in common with both of those things. You say, “Don’t eat the steak!” and then you leave the room. When you leave the room, your dog is deciding whether he’s going to eat the steak. When you come back, you may find steak all over the floor and a big mess, or you may find that you had an obedient dog. But the point is, your dog decided whether to eat the steak. Computer programs don’t do that. You tell your computer program to eat the steak or not eat the steak. Whatever happens is just going to be whatever the thing was programmed to do. It’s completely deterministic. But biological systems make choices and that’s why they’re able to create information. I think this is a really important question in even thinking about things like consciousness. Fourth, I believe that a solution to this problem will revolutionize technology and medicine. I think it could be a huge breakthrough for artificial intelligence. I think a company like Google or Intel or Apple would love to have something like this. Maybe it would mean that when you talk to Siri there’s actually somebody in there. And how could it not help us medically? Fifth, I think we have a long history of underestimating nature. I was talking a month ago to a young woman who does clinical cancer trials and she said, “You know, those cancer cells are really smart. You do not know how they’re going to fight back when you do something to them.” I think we’re constantly underestimating the intelligence of our components. If we under-estimate the sophistication of nature, it’s going to kick back in a really bad way. We have to have respect for what’s really going on before we start doing this. These are the reasons why I think this is really important. It’s not just a conceptual kind of a thing. No, this is a very fundamental problem in science and it needs to be examined very carefully. Evolution 2.0 is a book and it’s a prize, but it’s also a DMZ, a demilitarized zone. What do I mean by that? In South Korea you have this band of land between it and North Korea where there’s no shooting and where people can talk, even though they’re on extreme polarized ends of a debate. What I decided to do was trade the opportunity to punch someone in the face or win an argument for a demilitarized zone. What the Evolution 2.0 prize says is that, first, we have not solved this problem, and secondly, maybe we can solve this problem. But you can only solve it if you take it seriously and if you look at it. You have to listen to people and understand what they’re saying. I have read every stream of literature on this topic that I can possibly find, from every point of view, and what I’ve found was that there was genuine value in every corner – the creationists, the atheists, the design theorists, the physicists, the biologists, the doctors, the engineers, the philosophers and the theologians. They all had something useful to say. If you label them as idiots and you stop listening to them, then you just shut down the conversation. And you reinforce the negativity. And there’s already too much of this in our culture. You close off conversation, nobody learns anything, and everybody stays in their echo chambers. And that is a very big problem. What I want Evolution 2.0 to be is a demilitarized zone where we’re not shooting at each other and we’re not just trying to score ego points. I had to get some judges for this prize. 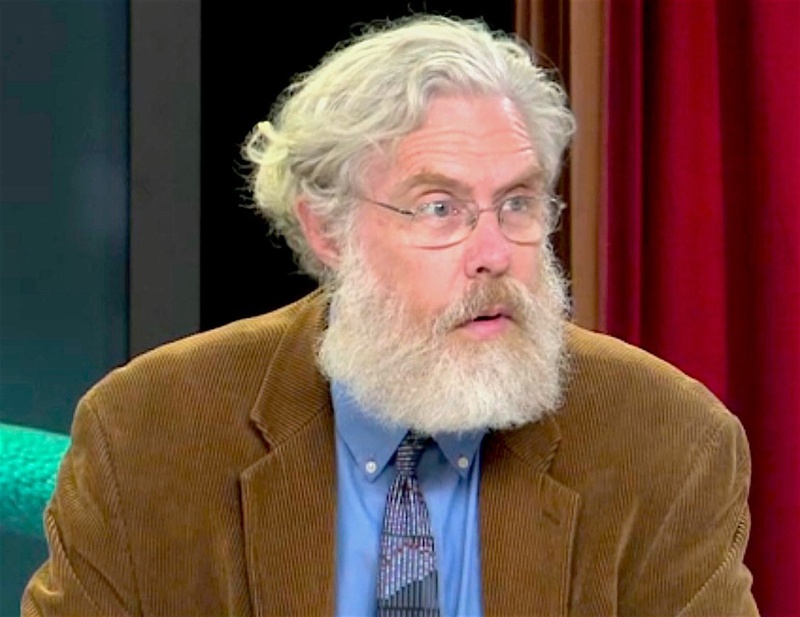 One of my judges is George Church. George is at Harvard and MIT. He’s the co-author of 425 papers and has filed 95 patents. He developed many methods for the first genome sequence. 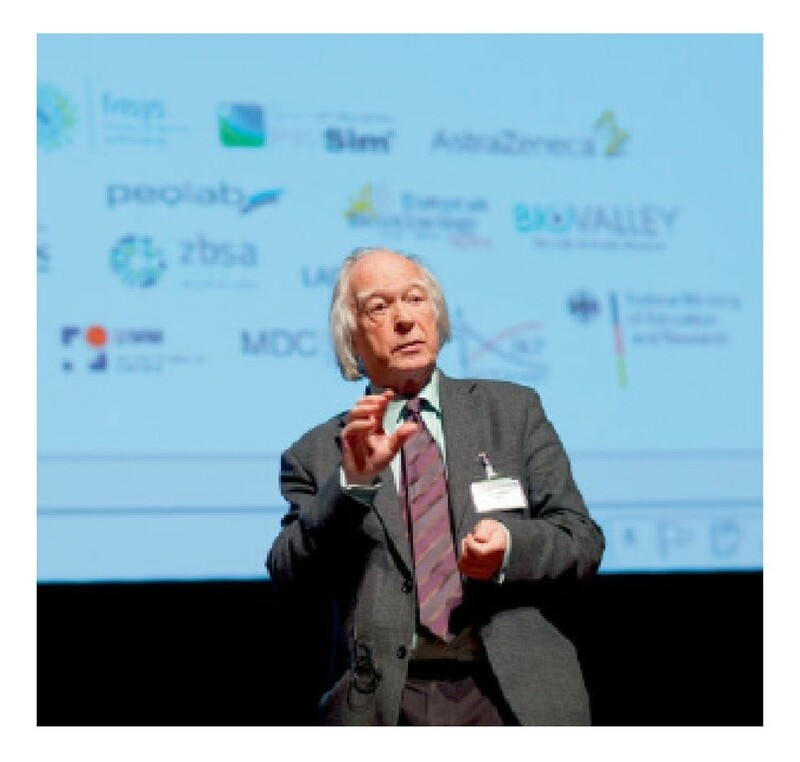 He’s a total rock star of genomics and he was kind enough to join me on the team. Another judge is Dennis Noble from Oxford. He’s one of the top 100 scientists in the UK. He’s a fellow of the Royal Society and has a Commander of the British Empire medal from Queen Elizabeth. He’s the guy who figured out cardiac rhythms, which made pacemakers possible. He organized the Royal Society Evolution meeting in November of 2016. A great guy. 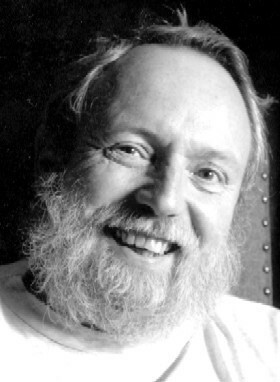 So Michael Ruse is a very famous atheist. He’s a philosopher of science at Florida State University specializing in the philosophy of biology. He’s testified in court trials about creationism and design. He’s a wonderful delightful guy and he’s also on my judging panel. The judges’ job is to mediate any disagreements and make sure everybody is honest. I also believe many breakthroughs that Silicon Valley seeks are already solved in the cell. I suspect there are all kinds of problems in logistics and computer technology and self-driving cars and who knows what else, that have already been solved in biology. We just need to go look at what’s going on and see how we can apply it. We just need to look in the microscope. You can post your entries at herox.com/evolution2.0. The site is hosted by the sister company of the X-Prize Foundation. It’s called HeroX, which is X-Prize for anybody. We have a $5 million dollar prize announced at that site. 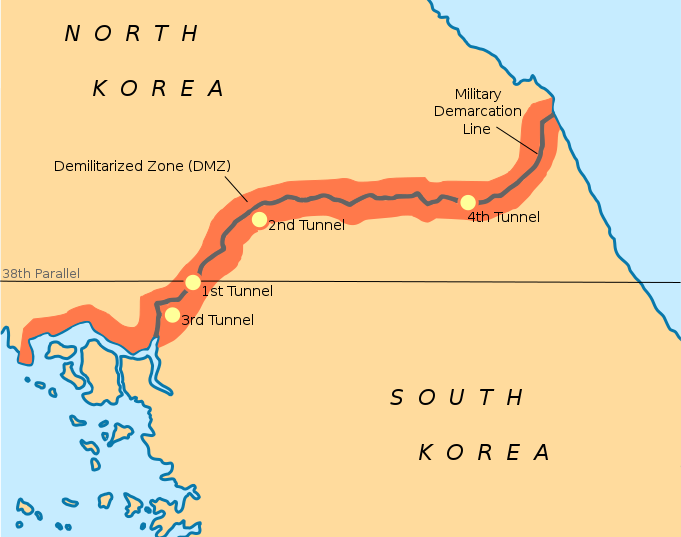 What are the rules of the DMZ, the demilitarized zone? I find that anonymity brings out the absolute worst in people. If you have to sign your name to what you’re saying online or offline, then you’re a lot more likely to say something that’s helpful. You need to assume that whoever you’re talking to is there for a good reason, even if you don’t like their values or even if you don’t like their position or their platform or the tribe that they belong to, or their metaphysics or their anti-metaphysics or whatever. You assume that they are here because they want to solve this, and there’s a good reason why they believe what they believe, even if you think it’s nutty. That’s what we have to do in this debate. We have to pursue the truth, pursue the truth, and ignore no verifiable fact. I believe that your will to discover the truth has to be greater than your fear of whatever that truth might be. Thank you very much. It’s been great talking to you. Audience: You haven’t talked about anything going on in artificial intelligence research. The reason I’m mentioning this is because I thought in that particular area of research they were using heuristics which attempt to mimic some of the processes of evolution. They’re self-correcting processes, right? Isn’t this a promising approach in your mind? All AI systems already have code built in, which is fine so far as it goes, and God bless them, but it doesn’t answer this question. I think this is a very, very fundamental question that nobody has solved so far. Audience: You’ve seen the work by Daniel Dennett? I’m a bit surprised you haven’t included him, since it’s supported by 50 years of research into consciousness. Perry: He hasn’t solved this problem, I can tell you that. Audience: You’re great when you speak on marketing, but this takes you to a whole different level in your enthusiasm. Anyway, in reading your book and different things, I kept thinking about chip technology and so forth, and also someone who is developing biologically-based inventions for hearing aids and vision and so forth. He made a switch over to analog for quite a while in order to advance what he was doing. I even called his office to see if he was interested in this presentation. On your contest form you say it will be digital, not analog. I’m just wondering what you mean by that, because I think maybe there’s something in the analog world that could help break open what it is you’re looking for. Perry: I’m originally an analog guy and I know analog circuit design. I’ve done audio stuff and I love analog stuff. But first of all DNA is digital code. The genetic code isn’t analog, so we have a problem there. Secondly, I don’t know of a way to define an analog version of this that would be rigorous, where you can definitively say whether you’ve solved this or not. Because of its digital nature, whether somebody solved this or not is very, very black and white. It’s binary. You’ve either solved this thing and you met this specification, or you didn’t. DNA meets the specification all the way through. If you could get ASCII code to somehow self-organize, or if you could get Morse code to self-organize, it would totally fit. The digital information problem is the fundamental problem that hasn’t been solved. I think it’s as fundamental as relativity or gravity or electromagnetism. This is a very fundamental question, which is why I’m at the Beyond Center, because they like stuff like this. Audience: We do recognize that life uses analog information as well. As you say, it’s not as sharply defined. The thing I thought of when there was a breakthrough in digital imaging a number of years ago, but when the guy did it, he actually produced the images through analog processes and then converted the analog image to digital to be able to transmit it. I don’t know enough about this to know if that’s what you’re talking about. Perry: I’ve worked with lots of analog people in my career and lots of digital people in my career, and I would say that the people that have done the most interesting things with digital systems have usually been people who understood analog stuff really, really well, and going back and forth because analog has those gray areas. It could be that whoever solves this actually starts with some analog thing. I don’t know, but thank you for a great question. Audience: A lot of the proof of evolution comes from like a whale with miniature legs or something, or a freshwater fish from a saltwater fish, but it’s interesting because if this programming thing is accurate, it doesn’t seem that anything we’ve ever found applies to a species changing from one species to a different species. It’s more like an adaptation versus an evolution. Evolution inherently says that a species changes from one species to a different species. A bird changes to a fish or an ape changes into a person, but it feels like adaptation is definitely something that happens within every species, and yes, they do change or evolve or whatever you want to call it. But it doesn’t feel like that’s actually evolution. Evolution seems like something else. Perry: A lot of people frame this as micro vs macro evolution. In Evolution 2.0 I frame this as the Swiss Army Knife of five evolutionary mechanisms: epigenetics, transposition, horizontal gene transfer, symbiogenesis, and hybridization. Those, as far as I can tell, are the major drivers of evolution. Viruses also come into the picture. The first three I mentioned are all more or less gradual changes, but symbiogenesis is merger-acquisitions. A chloroplast in a plant cell is actually an algae living in a eukaryotic cell. It’s like a Starbucks in a Marriott. Algae + eukaryote = plant cell with chloroplast is the world’s most successful merger acquisition. 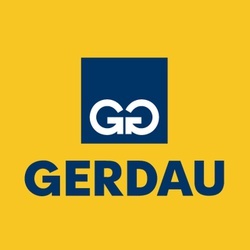 It’s the best merger in history. I’ve got a friend named Kwon Jeong from the University of Tennessee and he actually did a real live symbiogenesis experiment. I believe it was amoeba and X-bacteria. He put them together and they fought like cats and dogs for 18 months and most of them died, but then they merged. The bacteria was living inside the amoeba. The bacteria gave up some of their DNA, the amoeba gave up some of their DNA, they consolidated common functions the same way that it happens in a corporate merger acquisition. And he had a completely new organism. The definition of a symbiotic merger is that if you separate the two, they both die, and they did. So he achieved this in 18 months. Symbiogenesis theory has actually been around since roughly 1870 or 1880. There’s a fascinating book by Boris Kozo-Polyansky that was written in 1924 in Russia, and then this was almost completely lost, and then in 1967 Lynn Margulis fought a giant uphill battle just to get the idea re-introduced to the west. She submitted to 15 science journals and they all turned her down, and they all thought she was crazy, but now she’s a legend. There are multiple, multiple series of symbiotic mergers in the history that gets us to where we are. And then you have hybridization. Emmer wheat + goat grass = modern wheat, which is a doubling of chromosomes. It’s a new species by any fair definition. There’s something called Ohno’s 2R hypothesis which says that multiple rounds of genome duplications got us from invertebrates to vertebrates to jawed vertebrates, and the genetic record shows this. You don’t hear much about this because the creationists think that evolution is a hoax so they don’t tell you about this stuff; and most of the neo-Darwinists think that evolution is random, accidental and gradual, so they don’t tell you about it either. I’ve never seen anything capable of producing such a sense of wonder. Although I suppose the Goldilocks enigma might be right up there too. I would challenge the assertion that you can’t get new species. You can, and botanists do it every day. Audience: To be fair to modern biologists, I think they recognize that you can have gradual drift, so you’re really talking about two processes. You can also have these great leaps. There are arguments among them as to the relative importance of those two, but I think both mechanisms are recognized. Thanks for a great talk. How important is that 1, 2, 3 argument that you spawned the debate with? When I look at that, it looks to me like that’s a logical fallacy. What I thought was interesting when I first got into this was that there weren’t more people saying, “Hey, what about #4?” and that’s a completely fair answer. It’s not super productive in my experience – and I have a lot of experience now – to put somebody in a headlock and say, “Well, you’ve got to believe in God.” That doesn’t really work with anybody. First of all, I think the worst answer is to say that it happened randomly, spontaneously, and accidentally. I think that is just a terrible answer. It’s antiscientific and no thinking person should accept it. I think the success of whatever you’re going to do with this must be predicated on a belief that the universe is structured and orderly, and that the equations are beautiful, like all the other things that we find in science. I’m voting for the latter, and that’s where I believe that having a theological point of view helps science instead of hurting it. Audience: You may have just answered it, but I’ll try again. In your view, is the origin of DNA the only design component? And then everything after that follows from the existence of DNA? So evolution of the entire natural world stems from this originally designed code? Perry: That’s a great question. I think a lot of people would say that. Also, a lot of people (like Daniel Dennett) say if you have replication, variation, and selection, you will have evolution. My experience is no, you will not. Those conditions are necessary but not sufficient. You also have to have a couple other things. You have to have error correction in order to get evolution; and you have to have some kind of linguistic structure that follows ergodic patterns so that you’re not just adding more noise to the signal. Erwin Schrodinger had a concept he called negative entropy he wrote about in the 40’s. It was just basically the idea that organisms self-organize. They make things orderly. “I want to eat this food, I don’t want to eat that food,” and that’s negative entropy. You can think of evolution as negative entropy squared. Not only do we not know where codes come from, but we also don’t know how to make a system that self-evolves and self-evolves and self-evolves and self-evolves. Such systems are very hard to make in an engineering sense. I think we need to understand both of those questions, and I suspect that both questions are intertwined. Paul Davies: Perry, the problem with these sorts of arguments is that it’s very hard to see how all this sort of came into existence. There may be laws and principles we don’t yet know. It may be something less than something as universal as the law of gravitation, but some emergent complex systems. We’re working on all that at the Beyond Center, but even if we make progress on that, it may still be that the operation of these principles takes millions and millions of years. Then it’s hard to know where to begin, because that’s a long time to win your prize. If it turns out that the answer to this is just something that is very slow, and biologists or chemists have billions of years to solve this problem, then we’re going to be stuck. It’s really frustrating to think we might not get to the bottom of this, because it’s going to be some effect that is just really slow. You have the same situation with cosmology. Maybe there’s a force which is so weak we just don’t notice it in daily life, but it will come to dominate in trillions and trillions of years, but we can’t stay around for long enough to know it. That’s just a spoiler really. I don’t know that, and I really hope that we would get to the bottom of this, where the facts can be demonstrated in the lab in my lifetime. Perry: I agree with everything you said, Paul, and I have some comments. First, the fact that organisms can evolve very, very fast to me seems to at least suggest maybe we don’t have to wait millions of years to solve this. I also think we are just now defining the problem really clearly. Paul Davies: That’s why what you’re doing, coming from outside of the sort of community that works in this building, then setting out in your own quaint language a challenge that we all need to address. Because I think the origin of information processes is an absolutely fundamental scientific problem. We’re very far from solving it, very far from even knowing how to frame it properly, so it’s really good for you to be putting scientists on the spot, I guess. Audience: Did you come to the final conclusion that there is some kind of irreversible law of biology that we haven’t discovered, irreducible to physics or chemistry? Is that your current conclusion? Perry: Yes. The late biologist, Carl Woese, who was imminently respected – he was at Champaign-Urbana – he complained that biology, by trying to reduce itself to physics or what people sometimes call “physics envy” has become a lesser science than what it could really be. I think there are principles in biology that you can’t currently understand in terms of pure physics and chemistry. There might be emergent properties that – I think we only understand 5% of evolution at this point in time. We don’t understand 50 or 75%. Paul Davies: There’s intense research in trying to bridge the gap between chemistry and biology and I think the answer will be cracked eventually. Perry: It might. I’m all for it. Audience: Would that satisfy your challenge? Perry: Look, if you can solve the mystery, you’ve cracked the code. Here’s what it will do, though, is that every answer opens up three more questions in science. It’s always been true, always will be. You answer this, you’re going to have three more questions waiting right behind it; and we’re still going to be just as ignorant as we ever were, except that we know a few more things. My conception of the universe is that there may be no end to the layers of the onion. I don’t see us getting to the end anytime soon, and I think it’s great because it gives us something to do. Perry: That’s right. Maybe there’s a set of conditions where you can, with right temperature, right chemicals, right pressure – pour chemicals in your bathtub and get a self-organizing structure to send digital code from the left side to the right side. If you can do that, then you get $100,000. And if we can patent it, which our investors very much want to do, then you get $5 million and you’re partnered into our company. We want to solve this. Audience: Is this the working assumption of your scientists in current research? Paul Davies: There’s almost nobody working on this specific problem. 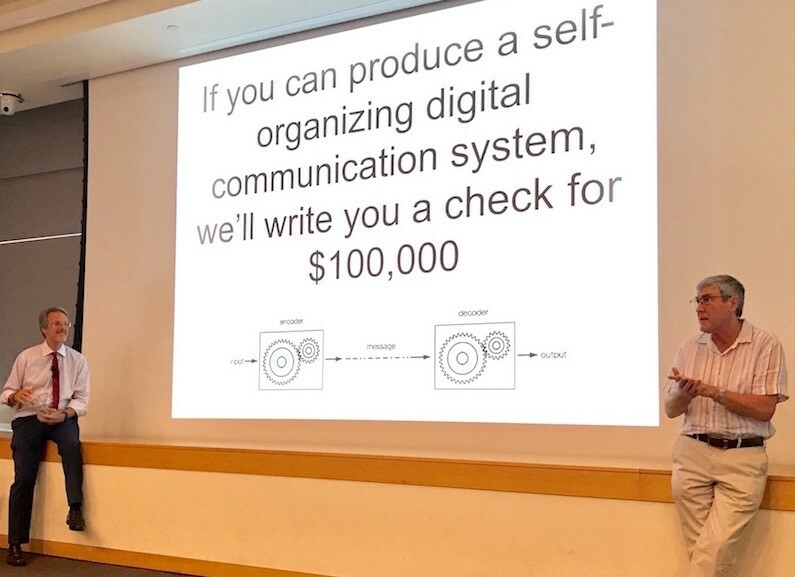 Paul Davies: It’s more or less the challenge that many researchers are working on, which is that information is self-organizing emergent intelligent behavior. This prize coming very close to what we were suggesting. I think that’s antithetical to the whole birth of science, which came out of Christian theology 500 years ago. They believed you could figure it out. They believed that God made a world that was divinely ordered, discoverable, intelligible, mathematical, logical and rational, and that studying it was an act of worship. I think saying, “You can’t figure this out” is not an act of worship. Audience: One of the things that I’m struggling with your challenge is that it doesn’t seem like you’re including natural selection. Natural selection is this feedback mechanism that either favors or disfavors a given feature, so if you’re randomly generating code and you don’t have that input from natural selection, you’re excluding a feature of the way evolution or DNA or anything else came to be. There was some interaction. It wasn’t just a creator doing one thing, it was interaction. And I’ll go theological with you with a question, which is do you think natural selection is God in your model? There’s two parts, that one and then the previous one is: How does an individual incorporate natural selection into this process? Perry: I didn’t talk about natural selection because I take it as a given. I know a lot about natural selection because I’m in marketing, advertising, and business, and there’s an awful lot of natural section. In fact, Google AdWords, which is one of my topics – Google is a big giant natural selection machine. When I started writing my Google books, what I was really teaching people how to do was to do accelerated natural selection tests to evaluate ads A/B. As soon as you know you’ve got a loser you delete it, you write another one, and it was replication, variation, and selection and here we go. There’s a number of people in the room who have done a lot of this. Raise your hand if you’ve done a lot of Google AdWords or Facebook advertising. Quite a few people. When you do this, you find let’s call it some emergent properties which you could never guess what’s actually going to work. At marketing conferences, sometimes somebody will do a presentation where they’ll show you Ad A, Ad B, Ad A, Ad B – which one won? Which one won? And everybody sits there and takes a little test and votes, and I always get 50%. It’s like blind luck. You never know what the market or what the ecosystem is actually going to want to do. In fact, I would insist that what we do in modern marketing and technology and everything is essentially the same as what happens in biology. Business is an epiphenomenon of biology, so I’m exquisitely familiar with natural selection. But natural selection only subtracts, it doesn’t add. Paul Davies: Well, natural selection can only eliminate … sometimes it’s expressed as the survival of the fittest (natural selection) as contrasted with the arrival of the fittest [variation, which natural selection doesn’t explain]. Biology serves up the interesting solutions to both, which is that we are trying to tease out the map between genotype and phenotype….enormously high-dimensional genomic spaces and people are working on the complexity of the type we’re talking about here. We are trying to understand the dynamics of these systems. It’s all just words at the moment, but we can explore this theoretically and eventually experimentally. Audience: Great talk, by the way. Whenever I think of this subject it always reminds me of the analogy about the likelihood of all this code or design or life in general resulting by chance. Maybe you already said this quote, I don’t know. It’s about the same as the unabridged dictionary resulting from an explosion in the printing shop. Have you ever heard a counter to that? I’m kind of in the same camp as you as far as believing in God and the creation aspect of things, but have you heard a counter to that analogy? What it says is that there’s an order and structure in living things that is very profound and we don’t understand where it comes from. What happened to me as I got into this was I started with the way engineers think, which is very linear. It’s very A, B, C, D, E, F. But the further I got in biology I found it’s very non-linear. Sir, in the blue, you talked about feedback loops. Natural selection is one kind of feedback loop, but there are thousands of other feedback loops within living systems. Like if you start taking guitar lessons you’ll get callouses, and that’s because your skin epigenetically says, “Hey, I’m getting damaged. I need to build up more dead skin cells,” and eventually it might be possible that you pass that on to your offspring. Or if you can’t with that exact example, you certainly can in principle with other things. Living things are profoundly orderly. I think it’s a higher view of God to propose that the whole entire thing could come from the Big Bang and you don’t need any other outside interventions, because maybe it’s fine-tuned to 1,200 decimal places instead of 120. For me, before I knew about the Big Bang, the world was an amazing place. Then I learned about the Big Bang and the cosmological constant and all that kind of stuff and it was like, “Wow, this place is even more amazing than I thought it was!” That’s been the progression for me. Does that help? Paul Davies: You ask, are there arguments against evolution being random, and the common reply is that while the variations might be random, natural selection often produces trends. Of course it’s a very well-articulated position by Richard Dawkins in his “Climbing Mount Improbable” metaphor. So that when given time, given changes among that population, selection would identify the successful ones and the process would move forward with incremental changes. I think Perry has explained very well how that is a partial but inadequate explanation, because we do climb mount improbable because of these major changes. Nobody insists that natural selection is random. Combine with the fact that there are stupendous periods of time. We don’t have a natural human intuition about billions of years. Audience: Yeah, that helps. Just one other side comment or question, and maybe this is off-topic, I’m not sure. I saw a show on a Netflix Cosmos episode 3 where he’s talking about the billions of galaxies and universes. Do you get into any of that aspect of things or do you think that’s not relevant whatsoever? Perry: Do you mean billions of universes? Multiverses? Audience: Yeah. That blew my mind so I just thought I’d throw that in there. Perry: I think there’s a responsible and an irresponsible way to invoke a multiverse. If you have a mathematical model of the Big Bang or string theory or something like that, and it explains a bunch of things really well, and that also as a byproduct there’s naturally other universes that come into being, and your model seems to hold together, then I think you have a very valid argument for a multiverse. I have nothing against a multiverse at all. However, if you realize that the universe is fine-tuned and supposing there were dials, and every single one of those dials has to be in the exact right place and you go, “Well yeah, but this is just one of the lucky ones,” I think that’s really lazy and it’s a blatant violation of Occam’s Razor, which says that you should seek the simplest possible explanation. It’s not even remotely elegant, and frankly it just raises more troublesome questions than it answers anyway. Paul Davies: I wrote a whole book, the Goldilocks Enigma, that gets into that. I think I’d say “two cheers for the multiverse” because it’s better in my view than saying “pure luck, end of story” because that’s still not an adequate explanation for existence. If you start off with the assumption that the origin of our universe is a natural event, then by definition if events can occur naturally, then they can occur more than once, because it would be a strange type of natural event that would just occur on a single occasion. That would give you a multiplicity of universes. But you still have to account for the laws and the initial conditions. A lot of people would agree with your position that if you say we just won the cosmic lottery, that’s no way out. And we should try to do better than that. It’s sort of inevitable it would lead to something like a multiverse, but it falls short of providing a complete explanation. The point is if you have a multiverse, you’d still need within that multiverse, meta-laws that would explain the origin of the universe. You need a universe-generating mechanism. Perry: We need a prize for that. Anybody got a universe-generating mechanism? Paul Davies: So if you have that, then pop pop pop - you get universes coming out of the machine. The currently fashionable version of the universe is inflation. But you still have to assume Quantum Mechanics and General Relativity and meta laws that give rise to these things. So now you’re questioning the origin of the laws of physics and meta laws that govern those. Sooner or later you have to face up to that. Perry: A coat hanging on a peg in thin air. Audience: I have a question about your video in particular. You had a few statements related to software and the way it currently makes decisions or doesn’t make decisions, deterministic, logic tree, Just in the last 12 months with things like Alpha Go … I don’t know if intuition is the right word but it certainly isn’t a logic tree, but that program beat the world-champion Go player 4 out of 5 times. Do you think your explanation of what we currently can do with software and we can currently do with AI is over-simplified to what we’ve seen change in just the last 12 months? Perry: At the end of the day, software is still deterministic and software only does deductive logic. Now, I might be going out on a little bit of a limb here, but my observation is that biological things do inductive logic. And I don’t know of any computer program that truly does inductive logic. I might be a little out of my depth with this, but my understanding is that AI as it currently exists – it’s amazing, and I get it, but it’s still just more and more and more and more complex combinations of logic gates. You can do very ingenious things with them, but they’re still deterministic. As far as I know that’s the case. Now, we’re on the edge of my knowledge there, and you probably know more about that topic than I do. Paul Davies: You can have stochasticisity in some way, with random inputs and feedback loops and then you no longer have a deterministic system. The answer is, we don’t know. I think living things have some form of self-knowledge, and computers don’t have that. Lynn Margulis said that a cell is a self. That computer program isn’t a self, so what is a self? We’re miles deep in philosophical questions as soon as we start asking things like this, and we don’t know. I think you have to be really honest about what we don’t know before you can get past it and then know something new. Paul Davies: I’m beginning to think we should wind up. Thank you for coming. I imagine not enough. Yes...? Se realmente está questão fosse verdadeira...porquê até hoje os chimpanzé ou macaco não estão se evoluindo? 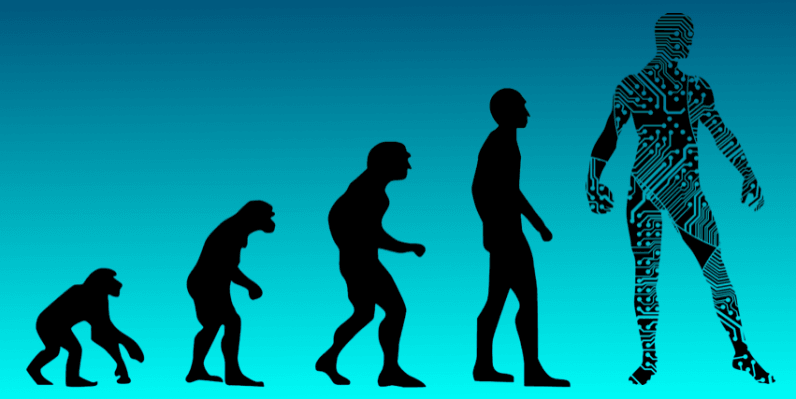 Com quando tempo anos ele se evolui homem? Será que os macaco também saberiam que iriam se evoluir humanos? O chimpanzé pode até ter uma semelhança do homem...por ser uma humanidade da caverna. A vida não é uma ciência...o que é uma ciência, uma química, física até mesmo uma matemática são as composição dela...quais são as composição de uma vida? São os elementos circulatório de um corpo e os seus componentes. We got your submission. We haven’t had time to review it yet. Thank you.